Casa-Nica is located in the small centrally located city of Masaya. Masaya is famed in Nicaragua for its artisan workshops and its cultural significance due to the number of indigenous people living there. It's a unique city that embodies the fusion of past and present, where men talk on cell phones as they drive their horse and buggies down the calles. There are very few foreigners in comparison to the other “tourist towns” such as Granada and San Juan del Sur (which are really fun by-the-way) which means you get a chance to really immerse yourself with the people as a local and not just another tourist. Masaya is also ideal for practicing your Spanish because unlike many of the tourist towns that have a large foreign and English-speaking community there are only locals here in Masaya. 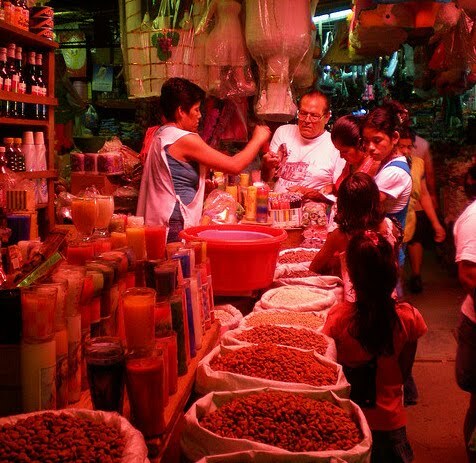 There are two nationally known markets in Masaya, the old and new markets. The artisan's market, or old market, was once a fort and home to Spanish soldiers. It now offers handicrafts from the workshops of Masaya and all over Nicaragua. The traditional market offers everything from fresh produce and dried spices to shoe cobblers and furniture vendors. Both are safe and within easy walking distance from the Casa-Nica house. Masaya is a short drive from Nicaragua's international airport making arrival and departure very easy. It lies on the Pan-American highway 25 minutes from the nation's capital of Managua and 20 minutes from the historic town of Granada. Masaya is also home to the nation's largest bus terminal and several international bus companies making travel very convenient. The surrounding geography includes volcanoes, crater lakes, national parks, and an assortment of artisan villages all of which are easily accessible from Masaya. Food There are many outdoor restaurants in Masaya known locally as fritangas. At these fritangas you can eat traditional Nicaraguan food for around two dollars a plate. Mexican food and pizza are popular alternatives in town. A little further down the road there are many international restaurants in the neighboring city of Granada, a 20 minute bus ride away. Alternatively you can cook in the full kitchen; there will be storage and fridge space for you to keep your food and a stove which you can use as often as you like. The local supermarket is only a couple of blocks away and is open seven days a week. Culture Masaya is known as the cultural cradle of Nicaragua. You will have the opportunity to witness Nicaraguan culture and participate in many local events such as running with the bulls during the Fiestas Hipicas, dancing marimba with the locals, and watching the fireworks display at Saint Geronimo Cathedral. 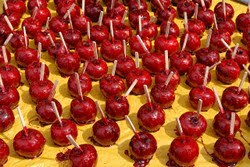 Masaya ends the year with the longest festival season in the country which lasts from September to November. The celebrations are a lively mix of pre-colonial and Spanish culture. Entertainment There is a lively nightlife in Masaya where you can relax and get to know the locals. Most of the best bars are only a few blocks from the house and are open late all week. There are a number of nightclubs in Masaya where you can dance all night to Latin music. If you want to go to the best nightclubs in the country, the night clubs in Managua are very accessible by taxi from Masaya. If you need your fix of modernity there are air conditioned shopping malls in Managua. You can get a bus directly there from the local bus terminal in Masaya. You will be able to shop for all the brands you are familiar with, catch a movie in English at the modern theaters and visit the food courts that have many of the major fast food outlets. Travel Getting around Nicaragua is easily done from Masaya. Buses leave all day to almost every major destination in Nicaragua. All of the major towns can be reached from Masaya in less than half a day. 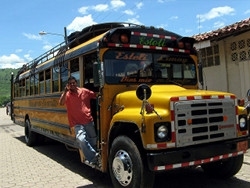 The buses are also inexpensive ranging from half a dollar to get to Managua to five dollars to reach the mountain town of Estelli in the north. International buses to the rest of Central America can be caught at various terminals in Masaya. If you have never lived in a developing country before, many of the living conditions and practices of the Nicaraguan people might come as a shock to you and there will be an abundance of visual proof that this is the second poorest country in Central America. Much of the tragic squalor surrounding such a beautiful people will sadden you at times…but that’s why we’re here to help make a difference! See the Gallery for more photos of Masaya. Masaya is surrounded by extreme landscapes. You will experience hiking in the jungle climbing to the top of a volcano and sailing amongst the islands of Lake Granada.